Posted on Tue, Jun 8, 2010 : 11:30 a.m.
Summer lunchtimes in Ann Arbor are getting even more musical —Â right on the patio of AnnArbor.com. Starting this week, AnnArbor.com will host free concerts at noon on Fridays. The shows will feature local musicians working in a variety of styles, and all will take place on the patio at our offices, 301 East Liberty in downtown Ann Arbor (on the corner of Liberty and Fifth Avenue, kitty-corner from the post office/Federal Building). The new effort joins the successful Sonic Lunch series, which has become a fixture on Thursdays. Know Obstacles open AnnArbor.com's series of free summer concerts. "We thought that a summer concert series was a great way to showcase the rich and diverse talents of local musicians while complementing the vibrant events that already take place in Ann Arbor," said Jill Tewsley, AnnArbor.com's events and promotions manager. "The lineup features students, teachers, business owners, and professional musicians. We hope that the individuals who come to these performances will not only have a great experience and hear some fantastic music, but that they might also discover something new about a summer music program, a school, a business or an organization in our community." June 11 - Know Obstacles (also known as KO) A six-piece rock band founded in 1997 by David Ziff and Steve Osburn. The band members are musicians with special needs. This truly exceptional band has played at a variety of venues throughout Washtenaw County over the last 10 years, including the Firefly Club, Ann Arbor Art Fairs, Lincoln Consolidated Schools, Washtenaw Community College, Saline High School, Oz’s Music Environment, Mott’s Children’s Hospital, Huron High School and the Michigan Union. Despite their longevity, most of the members of Know Obstacles are aged in their teens and early twenties. Given their youth, their musical range is impressive, covering Elvis Presley, The Beatles, Robert Johnson, Curtis Mayfield, Lenny Kravitz, Sheryl Crow and Green Day. This isn’t just a cover band, though; Know Obstacles plays a variety of original songs as well. June 18 - Sole Transit Sole Transit combines elements of funk, jam, New Orleans, blues, jazz and rock into an original mix. Members are Jordan Siden, guitar; Erez Levin, drums and percussion; Daniel Sagher, bass; Leif Gearhart-Hall, trumpet; K-Mo, tenor sax; Will Smith, tenor sax; and Paul Smith, keyboard. June 25 - Ann Arbor School for the Performing Arts — faculty members Details about performers to be announced. The Ann Arbor School for the Performing Arts is a community-based music school for students of age 2 to 72. The school aims to nurture and inspire musicians and to make music education accessible to all in the greater Ann Arbor community. The school sponsors private studio recitals, jazz band and orchestra concerts, and master classes featuring students, faculty, and guest artists. July 2 - Ann Arbor Symphony Orchestra Brass Quintet The quintet, members of the Ann Arbor Symphony Orchestra, will celebrate Independence Day playing patriotic favorites and American standards. July 9 - Nathan K Indie folk artist Nathan K plays "Guthrie-tinged folk jams; a golden, jangly folk style. Earthy, soothing sounds, tinged with ruminations on metaphysics alongside matters of the heart. His songs, and any self-references, are rapt with modesty and reverence," says Current magazine. July 30 - Dave Buehrer (Paledave) Guitarist and music teacher Dave Buehrer (Paledave) performs along with some of his students. He has played professionally in several cover and original bands. Currently, he is writing songs, performing, and has two CDs out with his band, Paledave. He also collaborates with his wife, Jennifer, as an acoustic duo, and with MannaFest, a band which devotes its time and energy to helping nonprofit organizations raise money. 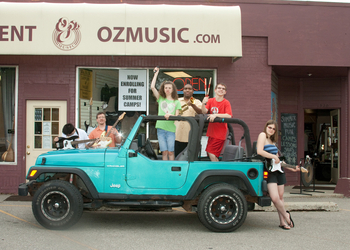 He teaches private lessons, mentors bands, and runs camps at Oz's Music. August 6 - Steve Osburn Musician and Oz's Music founder performs on the Chapman stick and classical guitar. August 13 - Sarah Swanson Indie singer-songwriter Swanson’s "Dark Sunshine" is a blend of '70s West Coast rock and dark, soulful tunes. The vocals and guitars are interwoven in original and hypnotic phrases. August 20 - Ann Arbor School of Performing Arts — student performance Details about performers/performance to be announced. To learn more about the Ann Arbor School for the Performing Arts, visit its website or contact Leslie Capozzoli, Orchestra Director, at lesliecapozzoli@aa-spa.org. August 27 - Ann Arbor School of Performing Arts — student performance Details about performers/performance to be announced. Wed, Jun 9, 2010 : 11:57 a.m.
That's the quintessential Annarbor.com article. Can't even correctly fact check or proof read the location of your own office. Wed, Jun 9, 2010 : 3:43 a.m. It is interesting to note that most of these bands will be playing for free or very little money. Sort of the same way aa.com pays it's contributers. And we all know you get what you pay for. Tue, Jun 8, 2010 : 9:03 p.m.
Kiddy corner from the Federal Bldg. Fifth and Liberty. Tue, Jun 8, 2010 : 8:31 p.m.
Im rather sure your patio is located @ the corner of S. FIFTH Ave. &amp; E. Liberty. Tue, Jun 8, 2010 : 4:35 p.m. I love this idea. I go see as many bands at Sonic Lunch as I can. Am happy to double my pleasure each week. Tue, Jun 8, 2010 : 3:22 p.m.